‘Ek Ladki Ko Dekha To Aisa Laga’ starring Sonam Kapoor, Anil Kapoor, Rajkummar Rao, and Juhi Chawla has been garnering positive response ever since the trailer is released. 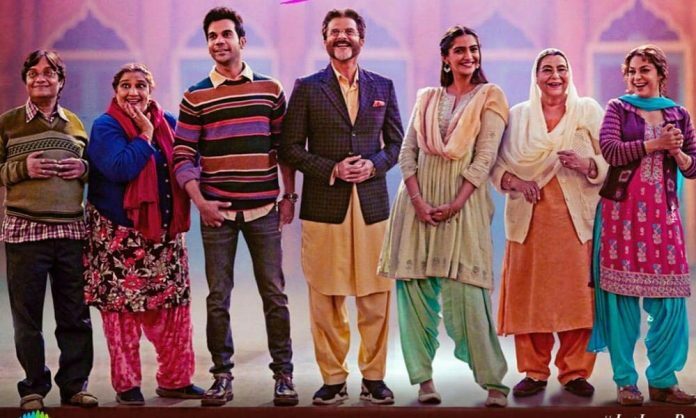 Owing with a positive response trailer of ‘Ek Ladki Ko Dekha Toh Aisa Laga’ starring Sonam Kapoor, Anil Kapoor, Rajkummar Rao, and Juhi Chawla garnered 13 million views in less than 24 hours in all social media. The trailer initially looks like any other beautiful love story but as the trailer progress, it takes us into the other perspective of a romantic relationship which is above gender, caste, creed or religion. The trailer begins with Rajkummar Rao narrating the story of a girl he fell in love with which is played by Sonam Kapoor. It also depicts the most unexpected romance of the year and the struggle of Sonam Kapoor defining her ‘Love Story’ to her father and her family. ‘Ek Ladki Ko Dekha Toh Aisa Laga’ brings the father-daughter duo Anil Kapoor and Sonam Kapoor together on screen for the first time. They will be playing reel life Father-Daughter in the film. Previous articleTumbbad, AndhaDhun, Badhaai Ho, Stree, Let’s Take A Look At Bollywood’s Surprise Hits Of 2018! Next articleHere Is How Disha Patani Has Become One Of The Most Bankable Actresses Of Bollywood!